T.J. Stinson has traveled as far away as New Jersey for his tree business. Sunni Stinson photos. Sunni Stinson has some advice for anyone trying to start his own business: Plan carefully and do everything by the book. 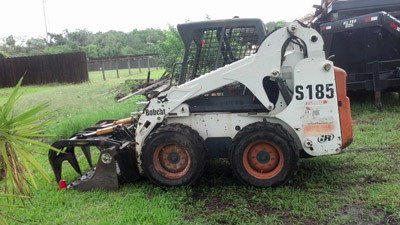 Sunni is the successful owner of TJays Tree Service in Ruskin with her husband, T. J. The couple started from the ground floor in the highly competitive tree business and three years later they are still growing strong. A combination of charity work, careful planning, a willingness to go where the work is and operating fairly with customers has been the key to their success, according to the couple who thrive in a business that is all too often plagued by fly-by-night operators who take advantage of customers and who carry no licensing or insurance. Fewer than half of small businesses started in the last four years are still operating, according to the Small Business Administration. Among the reason cited for the high rates of failure are lack of funds, lack of a strong business plan, no strong marketing plan, and lack of proactive, continuous, interactive customer dialogue to build understanding. Having hung out their shingle for more than three years now, the Stinsons have avoided many of those early pitfalls, and it started early, according to Sunni. Starting out with fewer than 15 customers, the company has grown to almost 100. They are currently one of the main tree service providers for Kings Point. “In the beginning, we just went out and knocked on doors and made sure we did quality work and went from there,” said T.J. Stinson, who grew up in the tree business, working for his father who ran a local tree service business in South County for almost three decades. “We had done volunteer work for the Ruskin Woman’s Club, and we got the word out, and it really went from there by people passing on our name by word of mouth,” Sunni said. Sunni is also very adamant about letting customers know there are alternatives. TJay’s Tree Service grew from fewer than 15 customers three years ago to nearly 100 today, thanks in large part to word-of-mouth advertising. While most of their work is in the Ruskin, Riverview, Sun City Center area, T.J. Stinson doesn’t think twice about jumping in his truck and taking to the road for work. 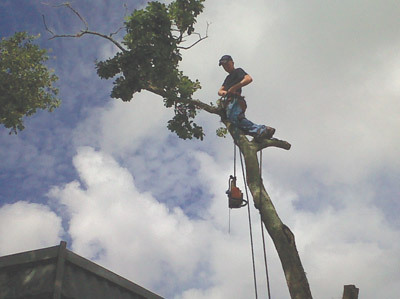 For more information on TJay’s Tree Service, call 813-309-0665 or 813-309-9825 or visit the company’s website, www.tjaystreeservice.com.